Start with Why was making the rounds of Opportunity Knocks (a local non-profit that supports the growth and development of entrepreneurs) and I was excited to read it. The timing was perfect, as I was about to design and launch my new website and this book blog. Knowing “why" seemed imperative! 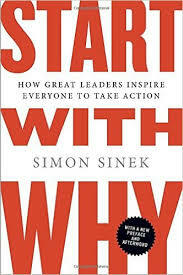 Sinek did convince me that having a strong "why" for the work you do in the world inspires others, attracts them to you, and creates loyalty. Fantastic! Figure out the "why" before the "what" and the "how." A great idea! He talks about Apple as a company with a clear "why" that inspires real brand loyalty. Apple's "why” is "to challenge the status quo" and "to empower the individual." I am hooked and raring to go! How do I do that? And then we go nowhere. What a disappointment. First and foremost, Sinek never guides you in how to discover your "why." He tells you in the last couple of pages to look backward. Hmmm. Second, he speaks almost exclusively to big companies .... About breeding trust among employees. I was looking for a great resource for entrepreneurs. Not this tome. Third, he is very repetitive. He stretched and stretched a short article into a book ... Like making pizza dough and pushing it the edges of your pan. Fourth, I wonder if he was funded by Apple. I was so tired or reading about Apple, with the same examples used over and over again, I wondered if I could abide typing up this posting on my iPad. Simon Sinek held my interest for a while. I give it two hearts because it didn't put me to sleep. But if you read the title, and really take it in, you can stop there. Find something else to incite your creative thinking.